Are you confused, afraid or suffering? Do you feel burdened by guilt or shame over past or present failures? Do you struggle with painful life circumstances that you feel powerless to control? Do you wonder where God is and why He doesn't seem to help? Do you feel confused about the promise of abundant life and wonder why you're missing out? You are not alone. I began life with many hopes and dreams, yet over time I felt beaten and battered by life circumstances or my poor choices. Confused and overwhelmed, I forced myself to conform my outside to what was expected of me by trying to achieve greater accomplishments, acquire more things and perfect my image. Yet inside, despite all this effort, I was filled with sadness, emptiness, insecurity and loneliness. So began my quest to find hope and peace in my life. Trusting in Jesus Christ as my Lord and Savior, studying the Bible, participating in 12 Step recovery programs and learning to listen and respond to the loving wisdom of the Holy Spirit caused significant changes in my life. I have peace I never had before. 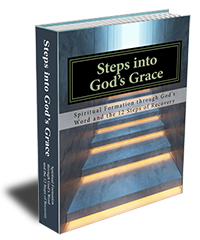 That is why I'm inviting you to join me and enter into a similar transformational, discipleship journey with God in this Bible Study, Steps into God's Grace. My prayer for you is that along the way, God will help you recover the truth of who you really are, who He is and how He has created you to live. As we take this journey together, I pray you will mysteriously and miraculously experience the healing power of God in your life. I pray you will enter into a love relationship with Him that is more amazing than you ever imagined or hoped for as He redeems, heals and restores you to your true identity and inheritance as His child living in His Kingdom of Grace.